Lots happening at GearTech at the start of 2018. 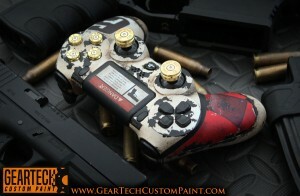 A brand new line of custom painted console controllers is going well. Customers can choose from a pattern we have already finished or send an email with ideas of their own. We will also be looking at custom painted Xbox and Ps4 shells to compliment the range. 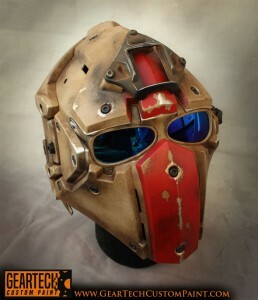 Our custom painted Helmets are still selling well and we should be getting more in within the next couple of weeks. Customers can buy them in a factory finish or as with all things GearTech have them customised in a finish of their choice. To add to these we are hoping to bring out a range of custom tactical vests/body armour with a futuristic feel. As always the main stay of GearTech is custom painting airsoft guns and the bench is always busy with interesting designs and finishes. Check out the gallery section to see what we have been working on recently. Finally GearTech will be able to offer a complete range of Specna Arms products. Many models in stock ready for next day delivery. For anything that we haven’t got on the shelf it can usually be shipped to the customer in around 7 days. Feel free to email any questions you have on this great range that offers trouble free airsofting at great prices.